My daughter ran towards me, her eyes shining. “What is it?” I asked, wondering what had caused such excitement. There was a short pause, as she padded away into the other room. Before long, she was back again. I wasn’t sure of the correct response to this one. I nodded. "What's the date today? QUICK! Check the date!" "It's Jessie J's birthday and she is TWENTY FIVE! And I caught her out swearing, didn't I? * She should know better now she's TWENTY FIVE, Mum, shouldn't she?" She turned on her heels again. This time she didn’t make it all the way back to her open copy of literary classic Jessie J: Nice To Meet You - My Story (sample chapter headings: Aries Adventures, The Voice, and Doing It Like A Dude). A thought struck her, suddenly, and she stopped, rushing back to me, almost squealing with excitement. Video is Jessie J - Domino. My daughter made me check this for swear words first. Video is a clip of Jessie J after she shaved her head off for Comic Relief. Sort of. 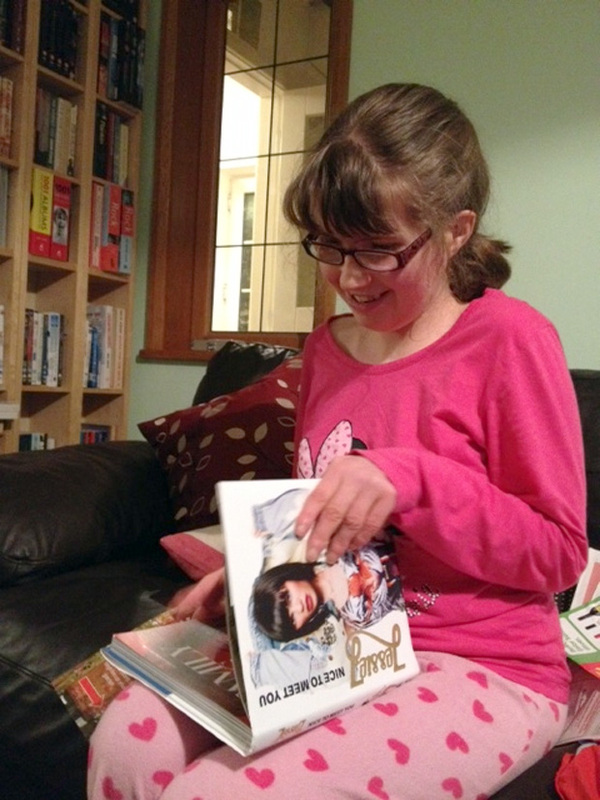 There’s a moment that all parents of children with a disability share. We lead very different lives, with very different children, dealing with very different issues, but we all experience the same moment once in a while. It’s a slap in the face that knocks the breath out of you and leaves a hot, stinging mark on your cheek. A friend described it on Twitter this morning. I know exactly what she means. I know that moment. When you have a child with a disability, life can be challenging, but you don’t spend every minute of every day thinking about this. You get on with things. You have fun. You don’t love your disabled child - you just love your child. But sometimes the differences suddenly hit you. You’re in a park and your daughter needs your help to clamber up the steps of the slide. And then you see a tiny toddler scale the ladder like a mini-Spiderman, and it’s like being struck by lightning. Your skin tightens with shock. The stark demonstration of the limitations of your child’s body singes your spirit. You can almost smell the burning. These moments are only moments, though. And there’s a flip side. Lightning can also strike in another way. A bolt can hit you on a different day with a completely different effect. You’re walking to the park with your daughter holding her hand and chatting as you go along, and you suddenly remember, in a flash, how there was a time when you thought she’d never walk or talk. This time the shock of the thought is a spark that makes the hairs on the back of your neck stand up, but it doesn't scorch. Its an electrifying jolt of joy. The Twitter friend mentioned above, who sparked off this blog entry, is @amandajmurphy a brilliant teacher, writer, and mum to a gorgeous little lad with Prader-Willi Syndrome, like my daughter. I wrote about our first meeting here: Links. You should check out her tumblr site: Life's Small Treats. My daughter is wearing a T-shirt bearing a picture of her own grinning face on it. It’s cute, in a slightly disconcerting, Zaphod Beeblebrox kind of way. It’s her trophy from her school’s Red Nose Day shenanigans. Her classmates each chose their own sponsored activity which they had to do for 30 minutes: one girl did a sponsored silence, another cut out as many pictures of red noses as she could, and my girl ended up choosing to dance for half an hour. What actually happened was that my daughter’s activity turned into something different. After a restless night the night before, she was a little tired and ended up falling asleep. “Mum, I won’t get my sponsor money, because I didn’t do my dancing,” she complained, her head face furrowed into a frown, her tummy face still beaming. I told her we could cross out the ‘Sponsored Dance’ title on her fundraising sheet, and replace it with ‘Sponsored Snoozeathon’ - but she wasn’t having it. That’s why we’re just about to compile a playlist for our own foot-stomping, toe-tapping, shoe-shimmying, happy hoofing session later. Comic Relief raised a record £75 million last night. Some people say that by raising Comic Relief cash, we are letting the government off the hook and paying for things they should already be providing. This is all well and good, and we could debate this in detail - but while we do that, the money is actually helping needy kids NOW. Others say that it’s hypocritical and sickening that rich celebs are jetted off to Africa to make documentaries about Comic Relief projects, and how shallow that makes people for having to be ‘inspired’ by celebrities. But they are completely missing the point: the charity sends the likes of One Direction to Africa because it helps. It means a legion of little girls who worship the gelled-up nincompoops learn about what the charity is doing. Your average One Direction fan is not going to sit and watch a straight documentary on the effect of a water-pump on a poor village community. But they’ll watch Harry, Barry, Larry, Mingo and Mudge’s film about it and the message will get through. This is A Good Thing. It's also extremely important to remember that while Wand Erection are there they’re not recording any songs. This Is A Very Good Thing Indeed. 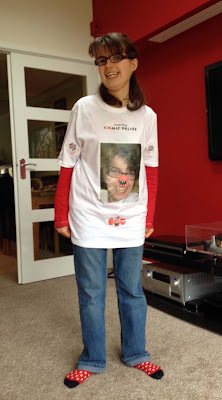 Video is Blondie - One Way Or Another (not the Comic Relief version, I'm not that cruel). Impressively, she decided to look for a suitable design on the internet that she could print out and colour in. It took her a while to decide. (I know this because of the pile of THIRTY-FIVE discarded sheets of paper printouts of assorted vaguely Mother’s Day-related colouring pictures). I overheard her trying to persuade her brother to ‘sign’ the finished article yesterday. A card, like love, is best when it's homemade. There will be a billion tweets, Faceboook status updates, and blog entries written today, of three different types. The first category will be those that say how much people love their mums. The second will be those saying how much people miss their mums. 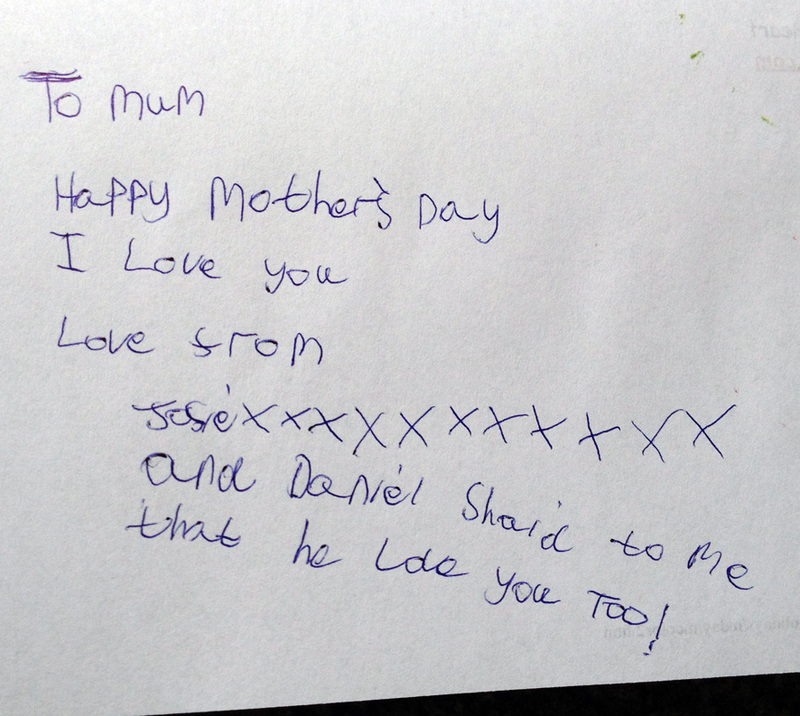 The third, and saddest, but thankfully least common, will be those saying how their mums weren’t wonderful at all. 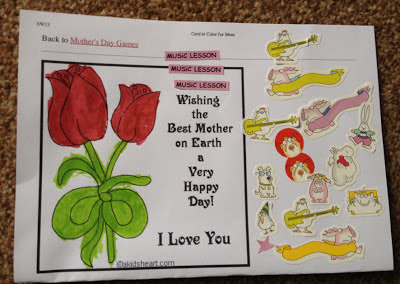 I know a few people who will be struggling with the second option today, whose mums are no longer around to receive a bunch of ropey flowers and a homemade card, and I can only imagine what they feel. I know how lucky I am. 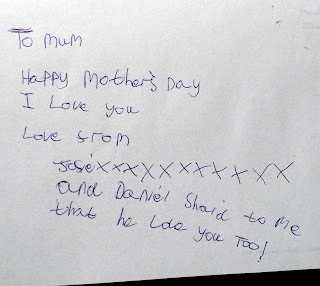 My mum, the nicest person I will ever know, is still here. I love her from my head to my heels. She’s cooking me Sunday lunch. Don’t judge me. Yesterday was a new medical experience for her in a new unit she’d not been to before. And she found it all quite fascinating. It was an MRI scan. After her recent bouts of prolonged sleeplessness, her consultant wanted to rule out the possibility of a rare, spontaneous side effect from her growth hormone injections: benign intracranial hypertension. The prefix benign does make this sound slightly less scary, but the idea of high blood pressure in the brain is quite alarming however you look at it. I watched the top half of her disappear into the hole of the giant, plastic, doughnut-shaped machine, large headphones clamped on her ears, and a soft toy cuddled up on her chest. Her legs and feet were sticking out, and her socks were all wrinkled up, the coloured heel of one having slipped round to the front of her foot. I expected I was going to have an anxious time on the outside of the machine, concerned about how she was feeling in there, stuck in that confining tube listening to a disembodied voice telling her to keep still and being bombarded with disconcerting noises. But any worries quickly dissipated. She was motionless. Compliant, chilled out, and unmoving (apart from an almost imperceptible tapping of her toe in vague time to the clangs and beeps and knocking sounds from the scanner, frankly the laziest raving to extreme techno music I’ve ever seen). It helped that she’d noticed the boy of around the same age as her who’d had the appointment just before hers. After quizzing the nurses about why he’d had to have a scan (they dodged the ‘breaking patient confidentiality rules’ bullet rather nicely by saying that “lots of people have scans for lots of different reasons”) she asked if he’d been still and did they think she would be “more still” than him. We turned it into a girls are better than boys type competition (always a useful tactic), and she made it her mission to beat him. 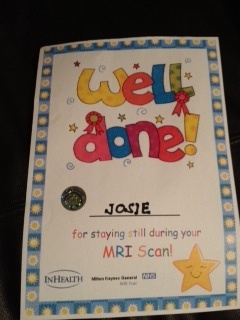 A certificate, a sticker, and a high five from the staff confirmed her position at the top of the MRI charts. Now we’re waiting on the results and oddly, I feel quite calm about them (as I don’t think the scan is going to show anything out of the ordinary). I’m becoming more convinced, as the pattern of a bunch of sleepless nights followed by a bunch of sleep-filled nights continues, that this is more to do with the potent mix of anxiety, teenage hormones, and that Prader-Willi inability to handle emotions. I am not a doctor. I could be completely wrong. What I might well be, however, is a bad mother. Because I’m sure, somewhere in the Parenting For Dummies bumper edition, it categorically states that ‘taking your child for an MRI scan does not count as a good day out’. But it kind of did: we had a few giggles, some nice chats, she was heaped with praise and felt proud of herself, and it ended up being something pretty close to fun. And what have I learned from today? A 14 year-old girl can go without a bra without any problems (the metal in the hooks can interfere with the scan, in case you’re pondering the relevance of this). But for her 41-year-old mother - who lost the battle with gravity some time ago - it’s really not such a good look.